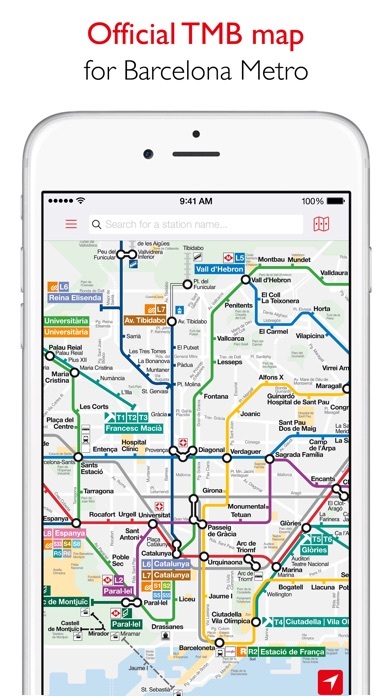 Barcelona Metro includes the official TMB metro map and a handy route planner. 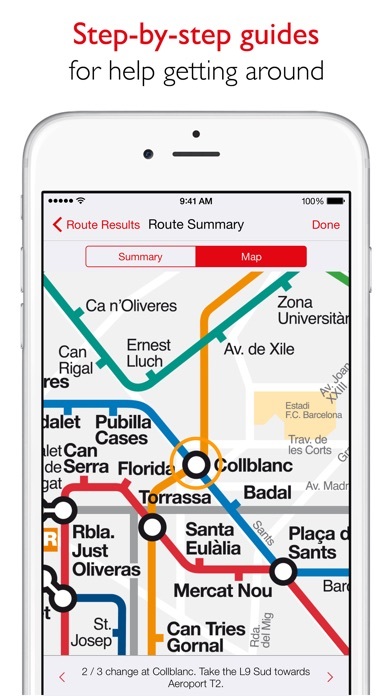 The free app works both with and without an internet connection to help you navigate around Barcelona on public transport, wherever you are! 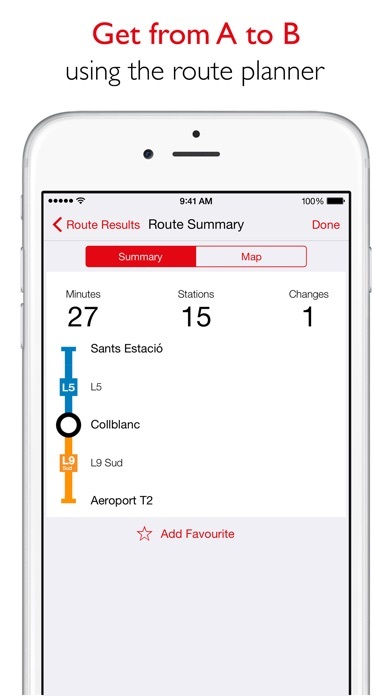 Features: Official metro map from TMB in an interactive app. Looking for the fastest way to get from A to B? Just use the route planner! Get helpful information for every route such as how long your journey will take and how many TMB metro stations you will pass through. Easy to search for a particular TMB metro station or find the nearest station to you. Navigate to popular Barcelona points of interest such as Sagrada Familia, La Pedrera or the Catedral de Barcelona. Follow your journey with step-by-step directions. Save your favourite journeys to use again when on the go. Live travel updates from the official @TMB_Barcelona Twitter account. 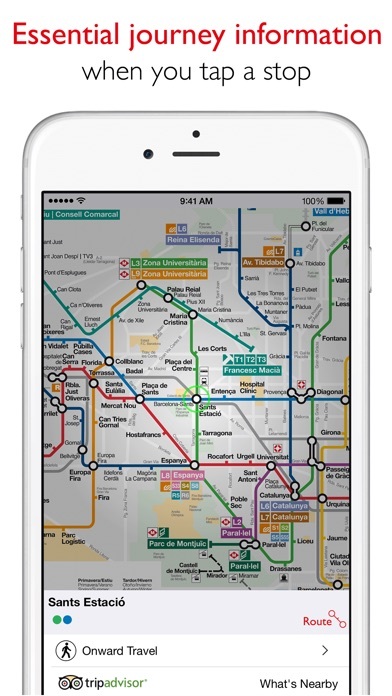 With over 39 million downloads worldwide, make sure you check out other Mapway transport apps such as Tube Map London Underground, Paris Metro and New York Subway. Join us on Facebook at www.facebook.com/MapwayApps or follow us on Twitter @MapwayApps. We would love to hear from you. Plan. Route. Relax. We just used this for our trip to Barcelona and it was perfect. The route planner is easy to use and it has a nice map feature to show you exactly how many stations you're going, what line you're taking next, and how long overall your trip will take. It was great having this as a dependable resource while traveling around the city. You can also search using your current location if you're not sure what the nearest station is. Recommended! Works perfectly. This is the app you need. I have tried several. This is the best. Overall it's a great app and is easy to use. But, it should have the direction the metro line is going as well as list out the metro stops on the way to your destination. This is a decent app, but they have expanded the lines, including one that reaches the airport but this is missing from the app. It should allow us to search up the name of the destination we would like to go. Sometimes I do not know what the name of the metro I'm looking is. I just want to find what metro is the closest to my point of destination in walking distance. Adding this feature would make the app a lot better. I purchased the ad free version. It does not have the L9 line and is incomplete. For me, this is useless. Get the free one from Barcelona Metro.